Aromaticity is an important concept in chemistry, usually referring to planar cyclic hydrocarbon molecules that exhibit delocalized π bonds, such as benzene. A group of researchers from PNNL, Washington State University, and Utah State University have more recently extended the concept to all-metal clusters consisting of main group metal atoms (X. Li, A. E. Kuznetsov, H. F. Zhang, A. I. Boldyrev, and L. S. Wang, Science 2001, 291, 859). While main group clusters can give rise to σ- and π-aromaticity, transition-metal-containing clusters can also exhibit d-orbital aromaticity and even δ-aromaticity due to δ bonding interactions. However, d-orbital aromaticity requires significant d-d bonding interactions, and unlike valent s or p orbitals, d orbitals are spatially more contracted and their tendency to participate in chemical bonding strongly depends on the metal and its coordination environment. While investigating the structure and bonding of early transition metal oxide clusters as models for oxide catalysts, researchers at PNNL and Washington State University accidentally discovered experimental and theoretical evidence of d-orbital aromaticity in two early 4d and 5d transition metal oxide clusters, M3O9- and M3O92- (M = W, Mo). 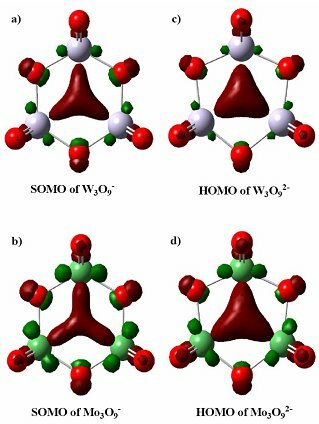 Neutral W3O9 and Mo3O9 clusters both possess D3h symmetry, in which each metal atom is bonded to two bridging O atoms and two terminal O atoms. The W3O9- and Mo3O9- anions also possess D3h symmetry, but there is a large geometry change relative to the neutral structures due to the occupation of a strongly M-M bonding orbital in the anions. The pictures of the singly occupied molecular orbitals for M3O9- are shown in the figure, indicating nearly pure three-center M-M σ bonding interactions with very little contribution from the O atoms. Occupation of this orbital by one or two electrons gives rise to strong three-center one-electron and three-center two-electron metal-metal bonds, respectively, which result in a significant reduction in the M-M distances in M3O9- and M3O92- relative to M3O9. The totally delocalized three-center bond renders aromaticity for both M3O9- and M3O92-, evidenced by their symmetric molecular structures and large computed resonant energies. The high stability of the M3O9- and M3O92- clusters suggest that they represent a new class of d-orbital aromatic molecules, which may be good redox species and may exhibit novel chemical and catalytic properties. The research was conducted by Xin Huang, Hua-Jin Zhai, Boggavarapu Kiran, and Lai-Sheng Wang. Reference: Huang X, H-J Zhai, B Kiran, and L-S Wang. 2005. "Observation of d-Orbital Aromaticity." Angewandte Chemie International Edition 44(44):1-5. DOI:10.1002/anie.200502678.